At J.H. 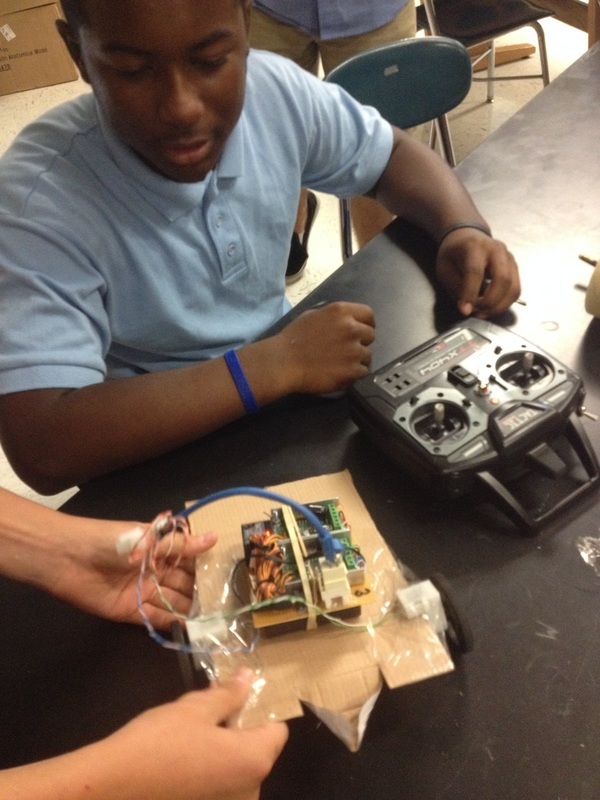 Rose High School in Greenville, North Carolina, teachers have been building in time for students to engage in interest-driven, production-centered work across grade level and across disciplines since the beginning of the school year. A partner of the Tar River Writing Project, J.H. Rose received a 2014 LRNG Innovation Challenge Grant which enabled faculty and students there to launch the “Pop Up and Make” project, supporting the creation of mobile spaces where students can play, tinker, make, and collaborate on a host of projects that speak to their interests in informal learning pathways. J.H. Rose has a SMART (Students Managing Academics Relationships and Time) Block lunch period that gives every student enough time to eat and do things like make up tests, get tutoring, hang out with friends and teachers, and meet with clubs. The Pop Up Makerspaces take advantage of that time, offering students scaffolded opportunities to explore their interests in digital storytelling and media production, upcycling, 3D modeling and fabrication, music production, and fashion/apparel. These spaces “pop up” across campus, not only in classrooms, but in places like the cafeteria where many JHR students congregate. Throughout the process, students have played a vital role in helping teachers identify their passions and build informal learning experiences around them. Student “Maker Mentors” also take co-responsibility for the development, promotion, and operation of the Pop Up Makerspaces. These Maker Mentors created and staffed pop-up spaces during a JHR open house last August, engaging visitors in entry-level makes and demonstrating how this work is student-centered, student-facilitated, and designed to maximize student agency in learning. The organizers of Pop Up and Make admit that getting the project started has been a little messy. “Not in a bad way,” suggests Michael Flinchbaugh, who describes the uncharted territory this is for the designers, both students and teachers alike. There is no clear “right way” to launch it, he points out, and admits that some of the school-based decisions have taken guesswork. Still, the Pop Up Makerspaces have been up and running during the SMART Block since late September, and there has already been positive feedback from students and teachers. On opening day, a bunch of kids were working with 3D pens, other kids were exploring modeling clay for the first time, and some kids and I were doing origami. Some of the students expressed that the origami instructions were really hard to figure out, and I was struggling too, as I’m not an expert in this space, but consider myself an engaged maker and problem-solver along with the kids. During our frustration, this really young kid, a brand-new ninth grader, comes up in the cafeteria and basically leads us through all of the complicated folds on a swan. He does origami on his own and was excited to be able to help us and share his interest with the rest of the students. Then I was able to show him another origami technique that involves folding the same piece multiple times to create a more complex structure. He was so excited that he took handfuls of the pre-cut paper with him when he left to work on at home. He’ll be back on Friday when Make 3D opens again. The “makers” of Pop Up and Make hope to see this kind of enthusiasm around interest-based learning and peer-supported discovery continue across the school year. 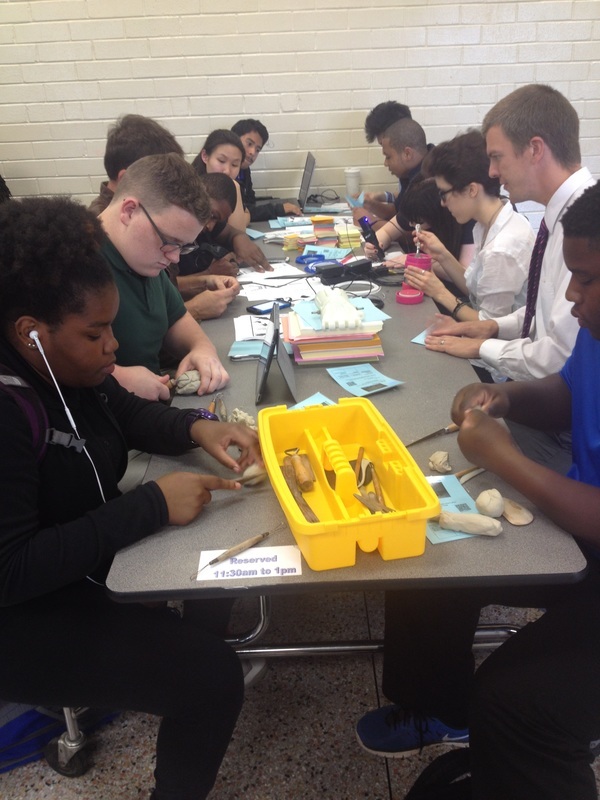 “Seeing students respond to the opportunities created by materials is exactly why we’re doing this,” says Michael Flinchbaugh, who, along with his colleagues, is eager to see students build connections between what they learn in these pop-up spaces and all the other spaces they inhabit, both inside and out of J.H. Rose High. Learn more about Pop Up and Make at the project website, where student makes are posted regularly, and follow JHR Makerspaces on Twitter @jhrmakes, #rampantsmake. You can also hear more about the project from Michael Flinchbaugh on Educator Innovator’s recent webinar featuring grantees of the 2014 LRNG Innovation Challenge Grant.